It’s that time of year again when the air gets cooler, tree leaves start changing color, and pumpkin spice-flavored coffee and baked goods take over everything. A great friend and I had a baking day, and the bake of the day was pumpkin bread! The goal was to bake something that would make the house smell like autumn! This recipe for pumpkin bread definitely did the trick! 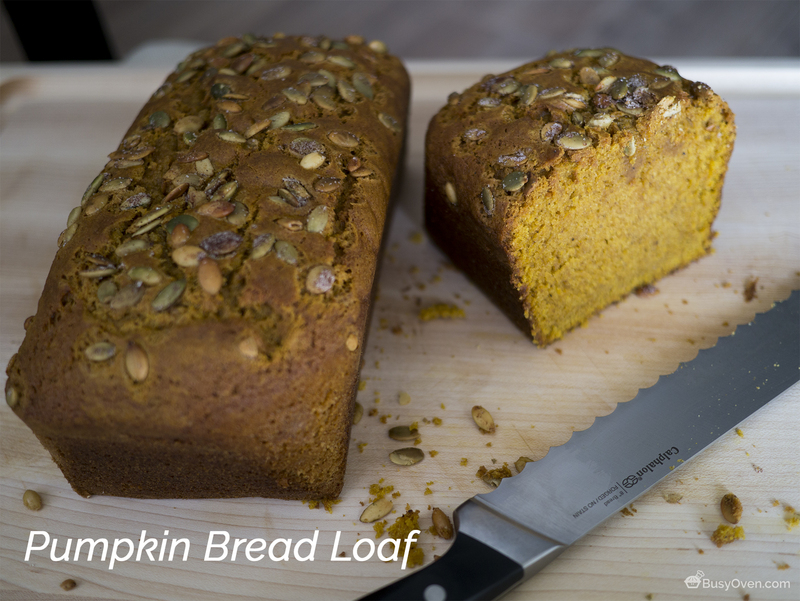 If you’re a real pumpkin lover, you might even like eating this bread with some homemade pumpkin ice cream! Full disclosure, I didn’t do much to help with baking the pumpkin bread because we decided to split up the work; one of us would work on the batter and the other would work on the pumpkin seed topping. I chose to prepare the cinnamon sugar pumpkin seeds, but I messed up because I started prepping the toppings too late! I should have made the toppings an hour before we began on the loaf batter. The plan was to melt butter, add cinnamon and salt to it, pour it over pumpkin seeds, bake it, then sprinkle sugar over the seeds. Because I started late, I poured the butter mixture over the seeds, but reduced the butter over the stove. After that, I took the seeds off heat and then sprinkled sugar over it. It was still really wet, but sometimes you need to work with what you have! The pumpkin bread loaves turned out to be really moist and incredibly tasty! I liked it because the spices were not overpowering and it wasn’t too sweet. The pumpkin spice in the bread was complemented nicely by the sweet pumpkin seeds on top! This is definitely a keeper for my recipe collection! Mix butter, cinnamon, and salt together in a bowl. Place pumpkin seeds in a large bowl and pour butter mixture over seeds; toss to evenly coat. Spread coated seeds in a single layer onto a baking sheet. Bake in the preheated oven, stirring occasionally, until seeds are lightly browned, about 30 minutes. Remove baking sheet from oven; sprinkle sugar over seeds and stir until evenly coated. Preheat oven to 350 degrees. Butter and flour two 9x5x3 loaf pans and then line with parchment paper. Set aside. In the bowl of a stand mixer fitted with a paddle attachment, mix sugar, oil, pumpkin and eggs until smooth on medium low setting. Set aside. Add the dry ingredients into the wet ingredients and stir together gradually. Mix until just incorporated and there are no lumps. Divide batter equally to the two prepared pans. Sprinkle the cinnamon sugar pumpkin seeds evenly over each loaf (use as much or as little as you like). Bake at 350 degrees F for 60-65 minutes or until a toothpick inserted comes out clean. When done, let cool in pans on cooling rack for at least 10 minutes. Remove loaves from pans and let cool completely. Slice and enjoy will still warm, if desired.